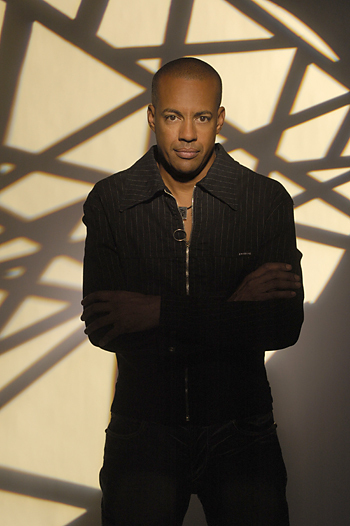 Tony MacAlpine’s name is widely recognized in the worlds of instrumental rock and fusion. For over twenty years, he has delivered numerous distinguished studio and live albums that showcase his formidable chops as both a guitarist and as a classical pianist. Many of the CDs were solo ventures, starting with his ‘80s classics, Edge of Insanity and Maximum Security (on Mike Varney’s Shrapnel Records, of course). At a time when Yngwie J. Malmsteen was first unleashing his fury by channeling his inner Paganini through the electric guitar within the boundaries of heavy metal, it was label-mate MacAlpine’s Chopin piano influence that, perhaps, helped to transcend the metal genre and incorporate elements of jazz fusion, classical, and blues. While this diversity may not have earned him a place in the Rock Star video game (some metal fans can be pretty singular minded in their musical tastes — especially back in the ‘80s), it certainly didn’t diminish anyone’s appreciation for his talent. MPc: Let’s talk a little bit about your new release, Clinophobia. The obvious question everyone wants to know [if you’re a brainiac or looked up the CD’s title in a dictionary] would probably be, are you afraid of going to bed? TM: (laughing) No. Well, we did come up with the title in jest. We were on the road quite a bit and we actually toured as a band, as a trio, before the release of the record. And one year before that, we did a tour of Europe and we were just talking about how crazy it was and how you actually didn’t sleep much, you know. And then if you developed this fear of sleeping… we were just kidding around, and that actually became the idea for the title of the record. MPc: Which is also ironic given that you don’t even have a song on the album by that name! TM: Well, we did [at first], but we changed it. 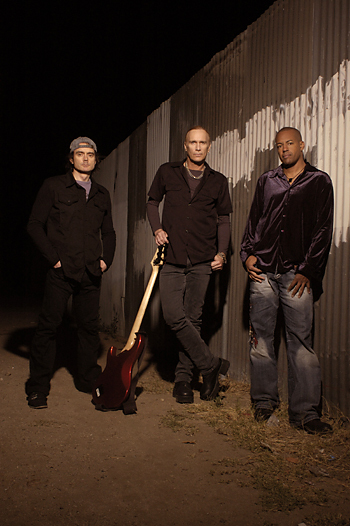 MPc: Looking back at your catalog of work, this might be the first album in almost twenty years that you played with Billy Sheehan on [the classic Edge of Insantiy from 1986]. TM: Well, [we played together on] some Steve Vai records, some live DVDs that we did. But, yeah, it’s the first studio record that I’ve done with Billy in about twenty years. That’s amazing, yeah. We’re really great friends. We share a lot of good times together, dinners and stuff like that, and he lives so close to me. MPc: How did you get hooked up with Virgil Donati? He’s an amazing drummer. TM: Well, I met Virgil years back in the Planet X days and was sort of recruited to come to that band, to join that band with Derek Sherinian. And Virgil was the drummer in that band. That started off our years of our working together and various things such as — he’s the drummer in CAB now, and he’s still doing the Planet X thing, but I’m long since gone from that. And I’ve done some solo tours with him — his own solo tours that we’ve done. MPc: On the new record, was this more of a collaborative band writing effort or was this a thing where you were writing the songs and then brought your friends in merely as the supporting musicians to play it? TM: No, no, it was definitely collaborative… especially more so with Virgil and myself. Because Billy was really involved at the time with doing his instrumental record, so Virgil and I took the helm of actually writing all this stuff. We definitely took the initiative to do that. And it was really Virgil and I writing together in Europe. We were on tour with a French artist named Michel Polnareff. So we wrote and recorded almost the entire record there. MPc: That must have been crazy, trying to write an album like this on the road. TM: Well… it was a pop gig. Michel Polnareff’s basically like the Elton John of France and that part of Europe over there. So we were playing, a lot of times, five or six shows in the same venue. And we had the time to actually go back to the hotel and really have some creative exposure, so it worked out. MPc: One difference I noticed listening to the new album compared to some of your older work is that keyboards didn’t play nearly as large a role. There were synthesizers throughout the record, but I was waiting for some moment where you were just going to totally shred on the acoustic piano. TM: (laughing) No, it’s a totally different formula with this trio. It was just really more or less rhythm and guitars and the bass and drums being more of a focal point. TM: (laughing) No. No. But, I mean, the songs go through totally different morphs and growth periods, and they changed so much from feedback from the different guys that were involved with it. The main thing is I did scratch bass stuff, and Virgil’s such a rhythmic player, so we really went with an emphasis on the rhythm of the record and not so much on — you know, the songs having a traditional arrangement, like here’s the introduction and here’s the guitar melody. We really just wanted to build it with, as if there’s a singer involved. MPc: You really struck a nice balance. On many of the songs, there was a very definite impression of verse, pre-chorus, chorus, bridge sections. And I found myself noticing that comfortable, familiar song structure, but at the same time I couldn’t really picture someone singing over it. TM: Right, right, right. We do do that from time to time, you know? When is the vocalist going to come in? There’s rumors that that is about to happen. But, you know, the way these songs are constructed, you kind of learn the idea of putting things together in a physical nature and what can be an accepted thing. But there’s a fine line so you know what an instrumental tune is and what a vocal tune is. I think it’s just being able to shadow that, and the emphasis of the construction being similar makes it more unique; it makes it have the strength that makes it almost like a vocal thing. MPc: So what is it that makes for a good instrumental? How do you write a good instrumental? TM: Well, I think you really have to… I’ve always thought you have to surround yourself with musicians that are better [than you], that really have a lot to say, and you have a lot of respect for what they’re doing, and they really have something to add to the whole party. That’s important, because a lot of times when players write instrumentals, they don’t typically share the writing duties with other people. And it becomes a very one-sided effort, like you just want to go back to your studio and put a drum loop up in your Pro Tools or your Logic, or whatever you’re doing it in, and that pretty much just becomes the way you build the song and it becomes very one-dimensional. I’ve always tried to make records less one-dimensional and entirely more group oriented. It’s going back to my first record that I ever did with Steve Smith and Billy. I always wanted to have a group of players come in and say “let’s continue that thing…” I can play all those instruments, but I never wanted to be the only musician, you know? TM: I certainly can play as well as these guys, but I didn’t want to spend that kind of time in creating [the parts] and deciding that it has to be this way, you have to play it that way and not this way, because really, it’s just a song. It’s just a song. MPc: It’s kind of funny that you said that, because we just spoke recently with Yngwie Malmsteen, who does things in exactly the opposite way, writing every part for every player. He’s very specific, down to every last note that anyone plays on any of the instruments, including voice in his songs. TM: Everybody’s got their own way. MPc: Yes. Personally, I prefer your approach. Just because you can play everything doesn’t mean you should. TM: No, you’re right about that. It’s like a movie, where you have different actors involved in it. You tell them just how to portray the parts or the characters. MPc: Exactly — you leave it up them to come up with the specifics. Now, going back historically, you developed your talent because you started out with classical musician training — piano and violin, I think. MPc: Did you actually go through any formal guitar instruction or did you just sort of use the classical background in the back of your head while you just hashed things out on guitar as a teenager? TM: That’s exactly what I did. I didn’t go through any formal guitar training. My brother showed me a few things on the guitar, and I was very grateful for that. And I used a lot of my ear, listening. The piano is such an orchestral and such a very fundamental instrument to learn. To be able to expose the early musician to the theoretical approach by looking at these things, very simply looking at it on the keyboard, is key. And it really develops your… literally, your music to help you become more intuitive and to be able to take those things over to other instruments. It’s a lot easier to do that playing the piano because you understand the rhythmic aspects of it, because it’s very percussive, and you understand the whole melodic sense, and you can see it. So my whole approach to the guitar is somewhat unorthodox in a way because I didn’t go through that formal guitar training. Well, I mean, over the years, meeting all these professional players and becoming friends and dealing with them and learning some things and, you know, it’s just been wonderful to be able to have that experience. Because there are a lot of simple things that people have told me to play and I’m, like, “I don’t know what you’re talking about.” (laughing) I can read charts and stuff like that, but when a simple chord, if I don’t understand what it is, I’m not going to be able to put my hands in that pattern. That was one of my earlier problems, but later on, I just started bridging the gap and realizing that I’m already playing that chord, but I’m thinking of it as a different type of chord. It’s like confusing major and minor chords with sus chords and things like that. So that’s kind of what I went through. Guitar players have their own theory. I think if I had studied the guitar, maybe I would have had a completely different approach and have a different sound. But I think that’s the reason why [I sound like I do] — I had no formal training on the guitar. MPc: Presumably that’s contributed to you developing your unique sound and style. Now, let’s talk about some of your gear because, obviously, our readers worship at the gear altar. I noticed on Clinophobia that you credit your endorsements with Hughes & Kettner and Carvin. Let’s talk about the various guitars and amps that were used in the recording of the Devil’s Slingshot album. TM: Okay. I used the TMAC 6- and 7-string guitars. It’s a [signature] line of guitars made for me by Carvin. I’ve been associated with Carvin since the ‘80s. Not really so much playing their guitars then, but they were making some mixing boards for me, some other things in my first, early studio I had in San Francisco. Been working with that company a long time; a great bunch of people. And after I played some other brands of guitars, I went to their shop in San Diego and tried some stuff and they made me a couple of pieces and I just thought they were amazing, and I’ve been with them ever since. Now it’s been so long — it’s over ten years now of just, really, playing their guitars. Really amazing guitars. And my guitars are—some of them are passive and some of them are active—you know, for different reasons. The guitars are just basic guitars when it comes to the electronics of them, except there’s just a slight, high winding on the neck pick up. MPc: Are you using Carvin’s pickups? TM: Yeah, they’re Carvin pickups. And they’ve been tuned really just to create more presence in the neck position when you use it so you don’t have that A.C. kind of sound. And basically that’s one of the things that was put on my guitars that I helped them come up with, but it’s not really a patent or anything like that, it’s just something that I prefer to hear. So the guitars are very much stock, but they’re guitars that I really played all the time, so they made them into a TMAC series of guitars. MPc: Tell us about your amps. TM: The amp’s really strong point is live. In the studio, it’s not really that important to me, because a lot of times we find ourselves using a lot of plug-ins, you know? MPc: Yes. A lot of players are recording with guitar plug-ins these days. TM: I mean, that’s what we did on the Slingshot record — you’re getting just great sounds out the door, moving things on the computer and you’re just throwing [virtual] mics up and it’s faster, really. These [guitar amp simulation] plug-ins are made by a guy named Bernie Torelli – it’s called Nomad Factory. Pretty amazing stuff. His website’s actually nomadfactory.com, so you can check out all his stuff. TM: Pretty amazing stuff. And then in a live situation, I use the Hughes & Kettner Triamps. Since I’m in the studio — in Europe we were all over the place and in different places, and we did some stuff on the bus with the computer. We didn’t have the luxury of carting amps around. We’d book studio time and go in here and just… we needed to get the thing done, and that’s how we did it. So it was a very simple set-up. There was nothing big, just guitar right in through the computer and just played it. Nothing on the floor or anything. On past records, I was a little bit more extravagant in what I was doing. For a specific approach, I would use different things like a wah pedal and a volume pedal here and there. But I’ve kind of shied away from doing that. I really do love to work in the studio at home and, for example, use a different variety of amplifiers. Different Hughes & Kettner things: the Triamp, the Attack head, all these other things that I can experiment with. But I also like recording things dry, without anything, because it doesn’t push you down a certain road that you can’t really get out of. You’re more able to be creative. I mean… you can do anything. You can add a wah pedal, an envelope filter, all these things later on. But you can’t really do that once you’ve printed it, once you’ve committed yourself. My techniques are changing. But that’s pretty much what we did with this record and how we did it. MPc: Let’s talk about your effects. Are you more of a pedal guy or a rack guy these days? TM: I’m continuing to use this old Digitech thing that I’ve been using. MPc: Which one is that? TM: It’s a Digitech multi-effects unit. It came out in the ‘90s, I believe, or something like that. It’s a really old, old unit (laughing). But what it is is that I really like the sound of the effect. I try different things. I kind of don’t like the gain structure… I think I’m just probably pretty used to it. I’m not really big on using delays and stuff a lot. So I usually have the sound guy — front of house guy, add things, because they know the set, you know? So they add things where we need them. But I must say that the reason why the effect — the Digitech effect, is not so important in the set-up, really, is because I use two heads. I have one head that’s effected and the other that’s dry. So it’s a mixture of the two sounds and just really one of the heads adds a slight delay so I can have more of a, I don’t know, more of a spacious feeling on the stage, so if it’s a tight stage, they can increase delay between the two amps. That’s primarily what I’ve been doing. As you can tell listening to my record, I’m not a Steve Vai gadget man, as I always call them (laughing). MPc: Mostly I just heard delays and harmonies. Do you play the harmonies live? TM: Oh, I’m playing them. Yeah, I’m playing them. We just double tracked these things and just went ahead and did them. MPc: And how do you recreate those in the live set? TM: Well, a number of different ways. Sometimes we might use a backing track from the record that plays in synch with the drummer so that we can incorporate that. And then other times, like with Ring of Fire stuff, we use keyboard players. It all depends on how committed we want to be in the set, whether we want to be able to change it a lot. So, you can do it like that night after night with a keyboard player, but you can’t really do that so much if you’re using the computer. If the band screws up, the computer always wins, which is really frightening. MPc: I know! I play in a melodic, progressive rock band and we play a lot of shows with keyboard parts on backing tracks and it’s like, god help you if your drummer messes something up and he’s not there with the click, or he counted off wrong and he’s four beats off. TM: Yeah, exactly! That can really screw with some people. I’ve always liked the rack-mounted effects over the floor things. I don’t know if you remember the Ibanez effects. I used to use the SDR 1000s quite a bit They had a nice, very heavy, but a nice feeling, nice sounding delay. I’ve had the luxury of people sending me a lot of different things, and even though these things increase with the bit rates and this and that… If you’re really locked into a sound and you really have an association with how to create these sounds, you can make these [old] things sound as good as any of the other effects people are using. For instance, when I was playing with Steve [Vai], sometimes I would play around through his rig and he’d go off in the back, and I just couldn’t play it! And he couldn’t play my rig, but I just really could make myself happy with that thing. And he’s got all this stuff, he’s got the frickin’ space center, it’s all high quality gear. And I just really couldn’t do it. And the same thing with Joe [Satriani]’s rig I used to play. Joe’s rig is a little bit simpler, though, than what I would have used, but his [Ibanez] guitars feel so different. So skinny and everything! And it’s all in such a different place, and it’s amazing what players are used to, but they play my guitar and they’re like, “This thing is so clunky.” But it’s kind of what I like, you know? MPc: What do think is more essential in getting great tone: the amp or the guitar? TM: I think it centers around… amplifiers really provide a distinctive sound, you know? A Marshall really only ever sounds like a Marshall, and I’ve played a lot of Marshalls. But the guitar is the one piece that’s either going to… if you’re at ease with your playing, you’re relaxed with what you’re doing as a player, your thought process is going to be free and the instrument is really going to have nothing to do with blocking that. And it’s happened to a lot of players — I think we can all associate what it’s like to have a great tone but a lousy guitar. And it’s really important to have a great-sounding instrument, a great-feeling instrument, and really decent tone. I don’t really like amplifiers that have a lot of gain. I really use them in such a way that it’s more clear; it’s just more pure tone. But I think the marriage of both of them is very important. There’s something that I’m seeking that the Hughes & Kettner amps provide for me, and it’s like this tube sound, but it has more of a… almost like a hybrid kind of sound that I like. And that’s what I prefer. MPc: Yeah, your tone is definitely hard to pin down. It’s easier to say what it’s not — it’s definitely not Marshall and it’s definitely not Mesa/Boogie. TM: Exactly. I used a little Red Box, too. That’s pretty cool. I mix quite a lot of these boxes in before you go into your computer. If you’re using plug-ins in the studio, you can run through little drivers and things like that and create some really interesting tones. Then you can get really lost in it and you have a different track where I just keep doing all these different things. You never get satisfied, though, which is kind of like the beauty of recording a long time ago. Back then, when we first started these records, we just had a Triton [mixing] board and a Studer machine, you know? And that was it. And you just kind of went for what you got and some little amount of variation that was applied to something. Nowadays (laughing), there’s so many different things that you can do before you even sit down and turn this stuff on and it’s just incredible to me. I still almost approach it, though, as if we do have limitations in the studio and with gear that’s more limited. MPc: Now by giving this CD a band name… Devil’s Slingshot. Can we assume that there might be more Devil’s Slingshot releases from the three of you? TM: Oh, yeah, definitely. For sure, there will be. MPc: That’s exciting. Are you working on anything else right now? CAB is actually, remember, the band is Bunny Brunell, myself, Virgil Donati and a keyboard player named Admar Reece, who just joined with the band. On the new record, we have just a bunch of different players, wonderful players on the record. MPc: Will we get to hear that CD anytime soon? TM: That’s coming out any day now. 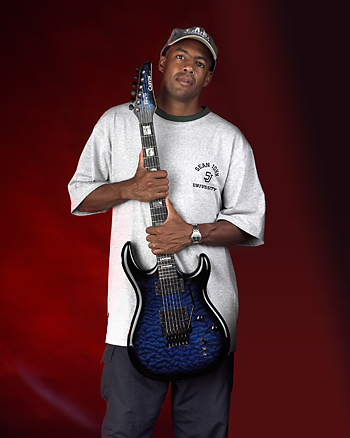 More information on Tony MacAlpine and Devil's Slingshot can be found at www.TonyMacalpine.com.